amy2004marie Men's Peach Clip On Cotton Bow Tie - Made In The USA by amy2004marie at SCRHI. MPN: 110107. Hurry! Limited time offer. Offer valid only while supplies last. 1 adult clip-on cotton bow tie. Measures 4.5'' across and 2.5'' wide. Cotton material. Bow tie clips onto each side of the collar of a button up shirt. 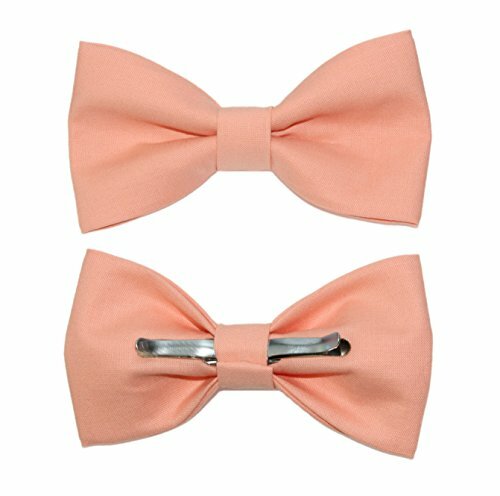 1 adult clip-on cotton bow tie. Measures 4.5" across and 2.5" wide. Cotton material. Bow tie clips onto each side of the collar of a button up shirt. Made in the USA.